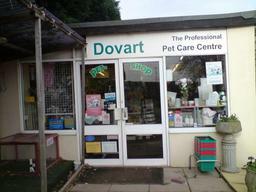 About Us Welcome to Dovart Pet Supplies and Boarding Kennels. Established in 1986 we are a friendly, family run business that pride ourselves on our service. We have friendly qualified staff who can offer nutritional and health advice for all of your pets. Our Services If you need to board your dog then Dovart boarding kennels offers the perfect getaway, you will be able to relax in the knowledge that your dog has been left in licensed secure kennels under the care of a member of our qualified experienced team. Specialist Services Boarding Kennels available. Offer free qualified nutritional advice. Our Shop Due to our extensive list of suppliers we are able to provide an efficient ordering service, being able to source most items quickly (if not already in stock!) This way you will always have the best possible choice. We also provide a local home delivery service please call for details or feel free to pop in to take a look around you will be pleasantly surprised in our "Aladdin's Cave". Our Kennels We also provide a professional boarding kennels so you can leave your dog with experienced staff, knowing he or she is in safe hands. Heated kennels (If Appropriate), individual covered runs, private grass field for 'On-Lead' exercise, individual diets catered for, luxury block available (subject to acceptance), inspection welcome (during kennel opening hours) and fully vaccinated dogs only.